As a regular user of Citrica Pizarra’s essential oils, Kate Vaughan was looking forward to meeting its owner Eva Zomeño, and discovering more about her business. She was not disappointed and reports back on a day spent in very inspiring company. Arriving at Citrica Pizarra I was immediately engulfed by the lemon trees lining the drive and the sheer abundance of greenery and growth! Eva took over Citrica Pizarra from her father and his father before him. Started in the 1950s in Murcia, the family made all their oils by hand, literally, as the essential oils would dissolve rubber gloves. Not for those with sensitive skin! They are now based in a scenic location in the hills outside Pizarra specialising in citric oils such as lemon, orange, mandarin, grapefruit, some lime as well as rosemary and rose petals for rose water, some cypress and sage. 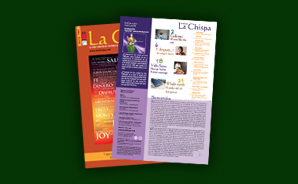 La Chispa likes to highlight local artisan type enterprises and Citrica Pizarra is an inspiring example. Eva has a profound and enthusiastic knowledge of essential oils, and a deep attachment to her work, but explains that Citrica Pizarra does struggle to compete against multi nationals – their small factory only runs sporadically these days, when there is oil to press. The sheer volume of fruit needed is staggering – about 1,500 kilos of lemons to produce one litre of essential oil … and in her grandfather’s days, when up to 60 local women were employed to press the oil by hand it could take up to 3,000 kilos for that same litre. Citrica Pizarra is not so much a business as a way of life says Eva and running the business includes her children and even a few of the local neighbours when it is harvest time. Unlike the big multi nationals Eva’s harvesting is governed by attention to detail and inherited knowledge… rosemary should be picked in the fuller summer sun, midday is best, green lemons picked in October or November produce more essential oil with a fresher smell and are then pressed immediately. “Recien cogido” (recently picked) and “puro” (pure) are words that pepper our conversation and the difference is clear. Tested by the University of Murcia a couple of year’s ago Citrica Pizarra’s lemon oil won prizes for having the best, purest quality. It is clear that while demand for Eva’s oil is strong and she has a loyal customer base business is not that easy. Determined not to give up, she has created a small line of 100% natural creams and massage oils already used extensively by local practitioners who appreciate the superior quality. Her plans for the future include a website to sell her essential oils directly as they are currently available only in Herboristerias or by mail order. Intrepid customers occasionally show up at her door and are rewarded as I was, by Eva’s warm welcome, quality, great value oils and a sense that here is an enterprise that values natural production techniques. In these days where we are all so removed from the production processes it is inspiring indeed. On my journey home I could not help but notice that I not only smelt fantastic, having eagerly tested the merchandise, but my spirits were definitely raised. Lemon oil from local lemon trees, what could be more uplifting as winter approaches?